A new optical microscope system called stimulation and imaging-based functional optical microscopy (SIFOM) can stimulate multiple cells simultaneously via a holographic method and monitor cell activity after the stimulation using 3-D measurements based on fluorescence holography. This system has potential applications as a tool for the reconstruction of lost nerve pathways, constructing artificial neural networks, and food resources development. The concept of SIFOM and the feasibility check were published on November 1 in Optics Letters. There are many optical techniques, including phase contrast microscopy, fluorescence microscopy, multi-photon microscopy and super-resolved fluorescence microscopy. Recent breakthroughs in optics technology have enabled scientists to visualize the ultrafine structure of cells and their functions in vitro and in vivo. Researchers can now use light to manipulate cell activity, a technique called optogenetics, by using channelrhodopsin or other related proteins (see figure 1). However, the present optogenetics-based light stimulation used to manipulate cell activity is too simple, using uniform exposure by LED or through optic fibers, so only a low level of cell manipulation is possible. This study proposes a new optical microscope system called SIFOM (figure 2). The SIFOM consists of two sub-functions: 3-D observation of cells and 3-D stimulation of cells based on digital holography. This is the first microscope to be equipped with technology that can simultaneously carry out 3-D observation and stimulation, and it has potential applications as a groundbreaking tool in the life sciences. Using high-speed scanless photography, this technology makes it possible for us to gain information about multiple events occurring in 3-D space within a very short time frame. During the verification experiment, they were able to observe light stimulation for a maximum of five cells at one time. The maximum number of stimulated cells is determined mainly because there is insufficient light power for stimulation. 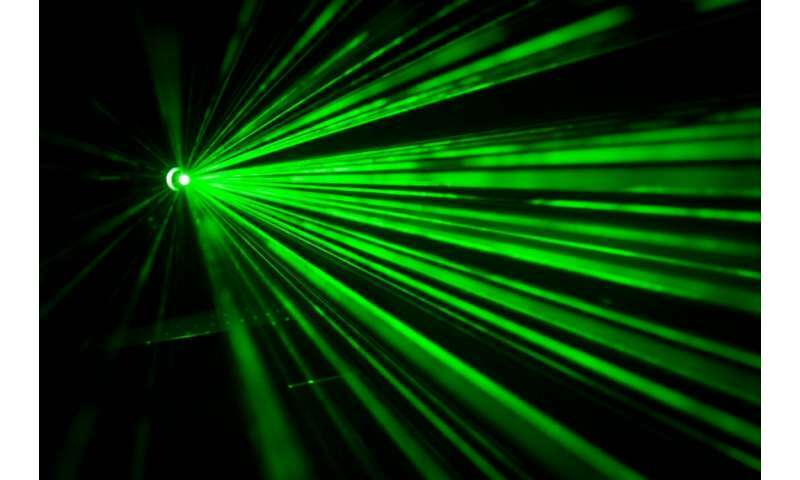 In 2-D (two-dimensional) space, it is expected that simultaneous light stimulation is possible for over 100 cells, and in the future, the team aims to expand the stimulation depth to a few hundred micrometers using two-photon stimulation. In order to observe living cells, there is a limit to the power of the fluorescence to avoid damaging cells, so high-sensitivity measurements are required. The team aims to overcome these issues and prepare the new optical microscopy system for practical use. Professor Matoba comments, "We have a research grant from JST CREST Grant Number JPMJCR1755, Japan to fabricate a SIFOM and then apply it to further development of neuroscience. We will collaborate with companies to introduce the new optical microscope into the commercial market."